Foolish is the individual who travels the highway of life without a Last Will and Testament. Just as imprudent is the philatelist who insists that he or she is in no need of a competent appraisal of their stamp collection. Since most competent appraisals cost about the same amount as a will, it is surprising to us that more collectors do not avail themselves of the many benefits that the appraisal has to offer. The key word here is “competent”. We’ll explain a bit later. Appraisals come in all types of categories, each with a specific purpose. We will briefly discuss the five most common types; Gift, Probate, Sale, Insurance and Capital Gains. The Gift and Probate Appraisals are similar except for the fact that the former is used when one wishes to identify the value of a philatelic gift made by a living person. This appraisal will assist the collector at income tax time. The Probate Appraisal, also necessary for tax preparation, is given to ascertain the value of a philatelic bequeathal made in a Last Will. Both types use replacement value which will be described later. The Sale Appraisal is frequently used by collectors to protect their heirs for the eventual day when the collection is to be sold. Unless one has found the secret method of transporting one’s collection to that great stamp club in the sky, all collections will one day be sold. The Sale Appraisal is also used by the collector who desires to sell part or all of their collection. Perhaps it is that collection of Upper Lower Island in which one has lost interest. Maybe it is a portion that needs to be sold to raise some cash for an emergency. Or perhaps it is a specialized collection that the local stamp shop is unable to handle. Whatever the reason, it is best to have an idea before the collection is sold as to just how much one may expect to receive from the sale. Earlier we mention that one should seek a competent philatelic appraisal. The runny-nosed youth next door who happens to head the school stamp club is no more suited to appraise your collection than is the local pharmacist. Neither is Uncle Ralph who just “knows” that your stamps are worth a small fortune. Why they must be, “For some of them are well over a hundred years old.” And, having a home-made appraisal with the values taken from a catalog or dealer price list is just as inadequate. A competent philatelic appraisal is always made by a professional philatelist, preferably an ASDA member, who is ready to back up the appraised value with a check for purchase at the appraised price. The appraised price must be such that, if the collection were shown to another dealer, the appraised price would be just as readily paid without haggling. Remembering that the professional depends on the purchase and sale of stamps and covers to ensure a continued livelihood, the appraised value must be one that enables the dealer to make a fair profit, not an exorbitant one. The Insurance Appraisal is an important type of appraisal should when purchasing a stamp insurance policy with one of the widely advertised providers. It is understood that it is not required to have an appraisal to obtain a stamp collector or dealer insurance policy. One merely lists a lump sum total of the replacement cost of the items in the collection, totaling all the lower-priced items and itemizing the more expensive ones. Replacement value is the amount that a collector would expect to pay right now if the collection were to be stolen. However, values change quite frequently. Remember that just a short time ago dealers were willing to pay much more for a set of Zepps than what they are selling the same set for today. The cost of this type of appraisal is so modest that the collector should give it consideration. Just as important is the matter of obtaining stamp insurance. At last glance with my provider, one could keep a collection valued at up to $50,000 in the home office without the need of a safe. Of course the coverage does not provide for damage caused by ketchup stains or coffee spills. This is the final type of appraisal we’ll discuss. Simply stated, this appraisal is based solely on the monetary amount furnished by the collector, using purchase receipts and invoices to obtain the figures. You should seek only a certified appraiser with experience in this field. To sum up the basics, the Gift, Probate and Insurance Appraisals use replacement cost as their basis. The Sale Appraisal is the amount that the professional philatelist will pay the collector to enable a fair mark-up for resale purpose. Gift appraisals are used to determine one’s tax liability. Probate appraisals are necessary to determine the replacement value of the philatelic items in the estate, again to satisfy tax liability. Insurance appraisals best protect the collector in submitting a claim should the collection be stolen. An Insurance Appraisal should be updated annually or, at least, bi-annually. Now that you are familiar with the various types of appraisals, let’s discuss what one might expect to pay for these services. We can only state our current fees. How these compare to other appraisers is unknown. It is suggested that you obtain at least two or three quotes and get a “feel” for the dealer before making a commitment. For all appraisals, except the Capital Gains, my present fee is 1% of the total appraised value. My minimum invoice for one of these appraisals performed in my office is $50 and $100 when conducted in the client’s home or place of business. Travel fees are separate invoice items. The Capital Gains Appraisal is invoiced at ½% of the total valuation owing to the more simplistic nature. The travel items are again invoiced separately. We normally waive all fees for established customers. Do yourself a favor by having the appropriate appraisal performed for your individual needs. By doing so you will do your loved ones the greatest favor. You will have the peace of mind knowing that, whenever the collection is sold, it will bring a fair price. You may be surprised at just how many attorneys and executors fail to seek competent (there’s that word again!) 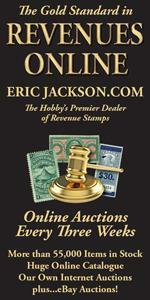 philatelic advice when handling the estate of a collector. In our long career we have had the misfortune to listen to dozens of horror tales at collections being sold for a mere pittance. Remember also that, just like the Last Will and Testament, you should have updates performed every year or two. Just maintain accurate records of all your purchases made since the original proposal was drawn up and you will see that the cost of the update is very reasonable, my fee being $25 at the present time. Again, there is no charge for established clients.